The NHLPA is heading to beautiful British Columbia on Canada’s west coast next week for the annual Summer Classic. The two-day, two-part event will include the 23rd annual charity Golf Classic, which will be held at Predator Ridge in Vernon, B.C. on Thursday, July 9th, as well as an NHLPA Community Celebration at Kalamalka Lake on Friday, July 10th. Dozens of current and former NHL players will be on-hand to participate in the Summer Classic festivities, including: Cam Atkinson, Dave Babych, Stu Barnes, David Booth, Jason Chimera, Cory Cross, Byron Dafoe, Brenden Dillon, Shane Doan, Devan Dubnyk, Andrew Ference, Cody Franson, Brent Gilchrist, Josh Gorges, Scott Hartnell, Peter Holland, Kelly Hrudey, Ryan Johansen, Bracken Kearns, Chuck Kobasew, Andrew Ladd, Curtis Lazar, Manny Malhotra, Dean McAmmond, Tyler Myers, Fernando Pisani, Joe Reekie, Brayden Schenn, Mathieu Schneider, Luke Schenn, Todd Simpson, Steve Webb and Rob Zamuner. With charity and community involvement being the focus of the entire event, the players will separate into groups for the golf tournament under Team Captains David Booth, Shane Doan, Andrew Ference, and Scott Hartnell. Each team will be playing for charities that are meaningful to them, a list that includes Hockey Ministries International, the BC Cancer Foundation, SickKids Hospital, the Canadian Mental Health Association, and many more. Since its inception 23 years ago, the NHLPA’s annual golf tournament has raised more than $3.2 million for countless charitable causes. Be sure to follow us on Twitter, Facebook, Instagram, Vine, and Periscope for full day live coverage from the golf tournament at Predator Ridge. We will be stationed at the 7th hole – the most iconic and picturesque on the course – to bring you photos and videos of the players as they relax, tee-it-up and support a number of worthy charities. Fans can join the conversation and follow along using the hashtag #NHLPASummerClassic. Part two of our Summer Classic takes place at Kalamalka Beach for a public Community Celebration event to benefit the Vernon Jubilee Hospital Foundation (VJHF). 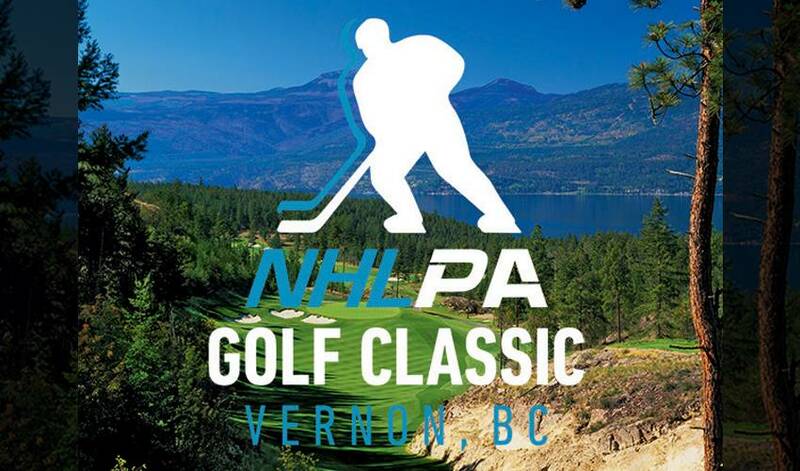 This event – in partnership with the City of Vernon, Predator Ridge Resort, and the VJHF – will be a family-friendly beach party bringing the community together with current and former NHL players for a fun-filled day of stand-up paddleboarding, volleyball, live music, and the opportunity to meet and mingle with your favourite pro hockey players. The NHLPA Goals & Dreams fund will also be making a significant donation of hockey equipment to local grassroots hockey programs in the area. Follow hashtag #NHLPAvernon for live coverage from the beach!